Members of the Mass. 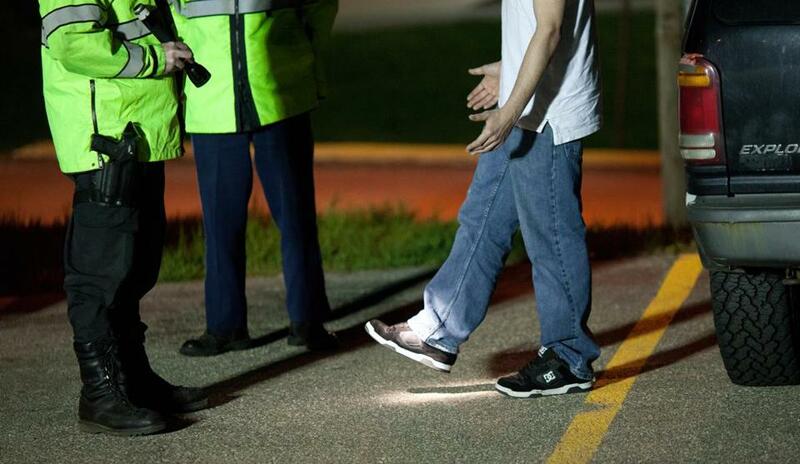 State Police performed a sobriety test on a driver in Chicopee in 2011. The state’s highest court on Tuesday limited which evidence can be used to prosecute drivers suspected of operating under the influence of marijuana, handing a victory to civil rights advocates in a closely watched case. Under a unanimous ruling by the Supreme Judicial Court, Massachusetts police officers can no longer cite their subjective on-scene observations or sobriety tests to conclude in court testimony that a driver was under the influence of marijuana. In limiting the use of the familiar roadside tests designed to provide an approximate measure of drunkenness — walking in a straight line, standing on one foot, and so on — the court found there is no scientific consensus those tests definitively prove someone is intoxicated by marijuana. The judges also noted the effects of marijuana on its users are more complex than of alcohol and less obviously correlated to the amount consumed, making it difficult for untrained observers to know whether someone is high. Police officers can still arrest drivers they suspect are high and describe in court how the drivers behaved during the roadside tests. For example, an officer could tell a jury a driver was unable to walk in a straight line. But under the ruling, the officer could not describe the task as a “test” or say the driver “failed” it. Similarly, an officer could tell a jury that a driver smelled strongly of marijuana and seemed confused but could not use such observations to conclude the driver was high. However, the court said jurors “are still permitted to utilize their common sense” in considering whether the sobriety assessments and other evidence indicate impairment. The defendant in the case is Thomas Gerhardt, who was stopped in Millbury in February 2013 by a State Police trooper for allegedly driving with his lights off, according to a statement of facts agreed to by both sides in the case. The trooper testified that he saw smoke inside the vehicle and smelled marijuana and that Gerhardt acknowledged smoking about a gram of marijuana. Gerhardt was unable to properly do the “walk-and-turn” test, the trooper said, and struggled to stand on one foot. The case has not yet gone to trial, amid legal wrangling over which evidence can be admitted. “The big take-away here is that for the government to introduce something as science, it actually has to be science,” Jacobstein said. The decision, she argued, does not make it harder for law enforcement to deter stoned driving. “I look at this more as a protection of people’s right to have only meaningful and relevant evidence used against them,” she said. A spokesman for Worcester County District Attorney Joseph D. Early Jr., whose office is prosecuting Gerhardt, said the decision “provides much-needed clarity regarding police testimony,” and prosecutors will use the court’s guidance in bringing the case to trial. Walpole police Chief John Carmichael Jr., a spokesman for the Massachusetts Chiefs of Police Association, doesn’t expect the ruling to significantly change how officers conduct traffic stops. Beyond standard sobriety tests, Carmichael said, officers carefully watch how a driver acts in general. He added he was relieved those observations will be still heard in court. “We’re assessing demeanor, attitude, attention span, behavior — everything,” he said. Carmichael called on the state Legislature to follow Colorado and Washington, two other states where recreational marijuana is legal, in establishing a blood concentration limit for THC, the main psychoactive ingredient in cannabis. “Our law doesn’t have the teeth it needs,” he said. Both states use a threshold of 5 nanograms of THC per milliliter of blood; in Washington any driver at or above that level is automatically considered impaired, while in Colorado those drivers can dispute their condition in court. However, some experts have questioned the validity of any law that specifies a particular blood concentration for impairment. Jay Winsten, director of Harvard University’s Center for Health Communication and a pioneer of OUI awareness campaigns, praised the court for taking a “middle ground” approach.